Sanitop® is made from a durable rubber compound formed with an alternating large and small hole drainage system to keep liquid and debris free from the work area. Designed to withstand harsh chemicals while creating a slip resistant surface, Sanitop® offers a simple, economical solution to almost any industrial or food service application. 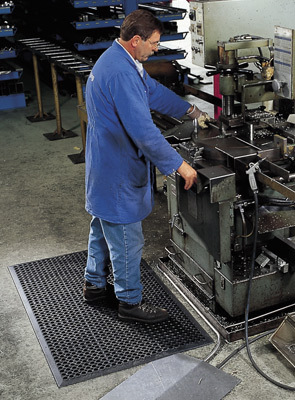 Black mats are grease resistant, while the red mats have extra nitrile making them grease proof. A durable rubber compound formed with an alternating large and small hole drainage system to keep moisture and debris free from worker platform. Raised pattern surrounds large holes to channel drainage and provide worker traction. All 4 sides feature integral beveled ramps to minimize trip hazards. Overall mat thickness is 1/2".